People around the globe had been, and still were being, transformed by the alien atmosphere-born virus identified by the Five Points of Freedom’s own Ms. Mercury. While these changes were obvious in some, they remained dormant in many others, only becoming evident in their progeny. There were a growing number of individuals born into Generation X who were more than human. As these children aged, their extra-normal nature became evident, sometimes in kids as young as five or six years old. Though from various ethnic, social and geographical locations, these children all developed the same set of abilities. The children’s eyes shown with golden glows and were capable of seeing complete darkness. The kids could levitate and fly through unseen propulsion. They were strong, lifting several tons even at a young age, and tough, able to survive bullets, bombs and even drowning unharmed. The public and world governments were concerned. Some countries screened their children and gathered the empowered for study and detainment. A group of children thus empowered, however, are not so easy to imprison. The U.S. took a less draconian approach, though some in the government would have preferred otherwise. 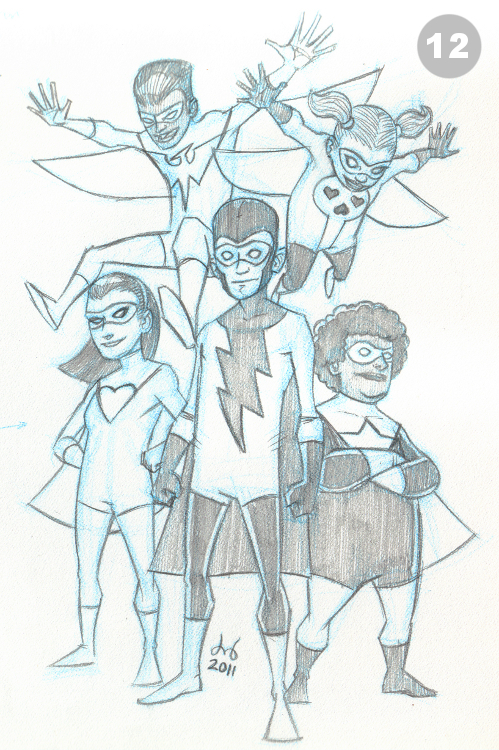 Under the direction of the newly appointed Secretary of Extranormal Affairs, Senator Trent Day, the Gold Gladiator and founding member of the Five Points of Freedom, all children with powers, inborn or otherwise, were brought into the Constellations program where they would be mentored and tutored in the use of their powers by other heroes. One group of powered youth, known in the media as the Adventureteers, gained fame when they saved billionaire philanthropist Aurum Silvers and his wife when his private plane was hit by an errant meteorite. Silvers and his wife were moved by the children’s altruistic act, though the kids were in no actual danger due to their super human natures, and decided to fund a youth hero team that would operate outside of the government’s control, allowing them to work in areas without political motives. Unfortunately, there were often political ramifications to their actions. The Adventureteers were led by Blastblolt (centered) and included (clockwise from center) Princess Heartshine, Pterodactyl, Skullcrusher and Gold Star. It should be noted that the children named themselves.